Considering that the sun had showed us his face only once before during our voyage north from Natales, that golden evening in front of Amalia was especially serendipitous. By dawn the following day normal service had been resumed. Above our masts the clouds hurtled past, and the rain drizzled down obscuring even the little glimpse that could otherwise be had of the glacier. The weather forecast, obtained via our satellite phone, had predicted a north-westerly force six. 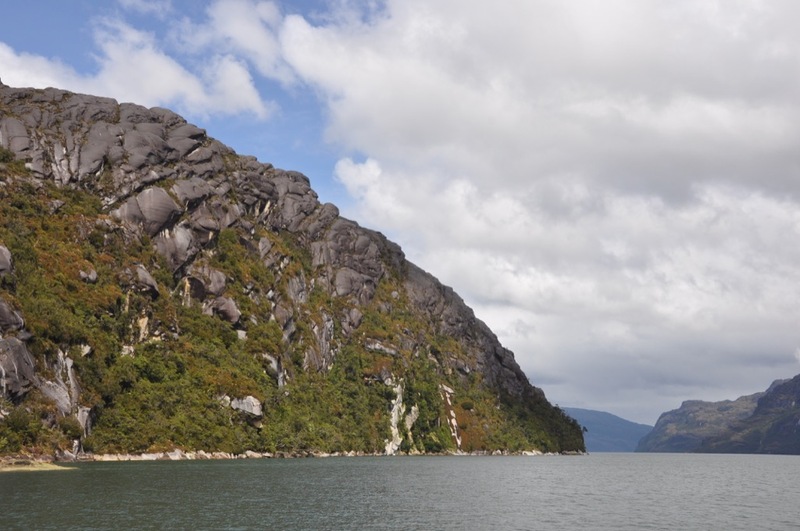 Our plan now was to continue up the Peel inlet, visiting the Calvo estuary and then proceeding all the way to the head, but it seemed to us that such a strong wind, hitting the mountains, would bounce off them and be funnelled down the narrow gorge. 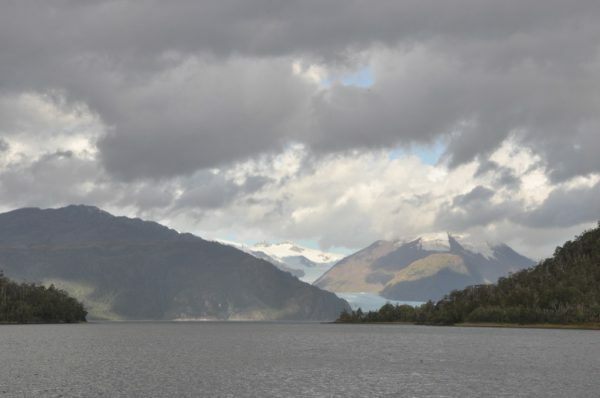 We didn’t fancy our chances of making up into it – not, in any event, at the rate needed for us to travel the 25 miles from the Amalia fiord to the Calvo – and so we decided to stay put. Based on our later experiences I should say that this surmise was not entirely correct. There are times when the wind does indeed ‘get in’ to the Peel inlet, and when it has found its way in then, like the air passing through the venturi in a carburettor, it is bound to be accelerated; but, equally, the wind will only get in when it is blowing from precisely the right (or wrong) direction. As often as not the upper reaches of this inlet are absolutely still, the tall mountains merely shielding it from the wind rushing by above. 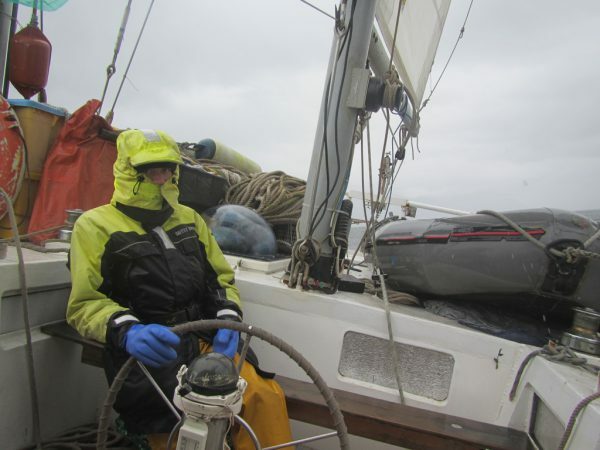 When the forecast showed us strong winds for the following day also, we again remained in harbour – but in retrospect I’m not at all sure that we needed to. 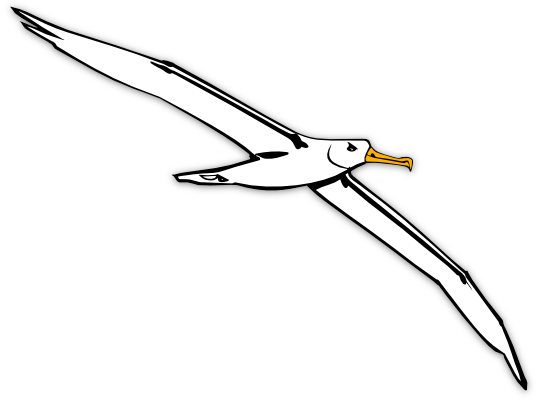 When he was unable to get to Caleta Amalia (or Amelia, as he calls it), Tilman anchored in a much smaller cove a mile to the north. 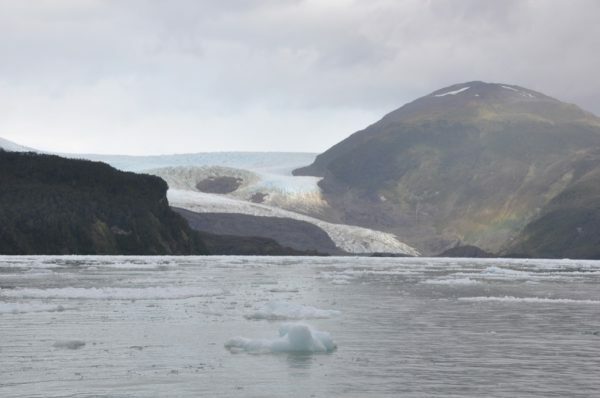 On the following day, after leaving this inlet – and after inadvertently discovering the moraine which straddles its mouth – he punched his way north through the ice for about six miles to reach a place which he christened Waterfall Bay. For us there were no such dramas. The moraine is now shown on the chart, and of ice there was none; we had a clear passage. The sun was still hiding on the far side of a low blanket of clouds and the view up the inlet was thick, but the wind blew a handy force five enabling us to make up nicely under second-reefed main, half-furled genoa, and the mizzen. The weather was less than lovely. 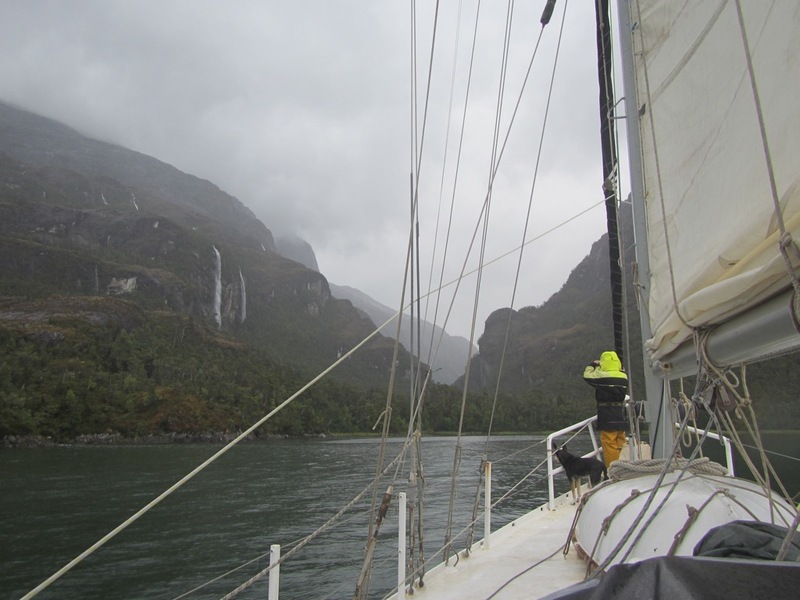 Identifying Waterfall Bay from Tilman’s description of the glacier behind it, we observed that it didn’t offer a very snug anchorage. We preferred the look of the shallow bight on the opposite shore (on the west side of the Peel inlet). A quick survey, under engine, disclosed two small patches close inshore where it would be possible to drop the hook and tie up. For the most part the walls of this fiord are so sheer that the depth is still 50m or more when one is within a boat’s length of the shore, and thus these two shallow shelves were eagerly noted on the chart. The first (at 50° 44.43′ S, 77° 21.22′ W) is sited almost beneath twin cascades which come crashing down from the cliffs above – and so we named it Caleta Gemelos (Twins Cove). It lies in the mouth of a narrow valley and might offer access to some good hiking. The other (at 50° 54.26′ S, 77° 49.04′ W) is in the mouth of a very shallow notch, and we noticed a fisherman’s line in the notch – so we christened it Caleta Pescador. On a clear day either of these refuges would offer a splendid view of the glacier on the opposite shore – which glacier was, of course, the object of Tilman’s interest. On the chart it is called Nigel. Nigel…! I ask you! It’s a suitable name for a son and heir, and a rather grandiose one for a cat – but for a glacier…? 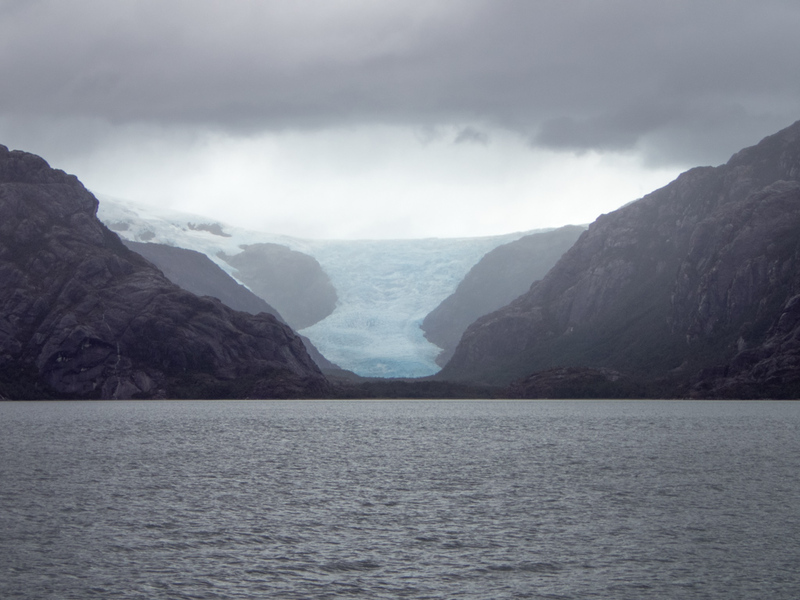 Meanwhile, the glacier lying to the north of the Calvo estero is called Matthew. Tilman does not expressly state that, in his time, Nigel touched the water, but he implies that it did. He talks of a great white stream of ice which broke into “a myriad of cracks, seracs, and crevasses, many of them scintillating with a vivid blue, as they plunged steeply to the ice-strewn water”. Now, this glacier has shrivelled to half of its former width and it ends three miles from the shore. One could probably now gain access to it up one of the clefts in the valley-side, but in Tillman’s time the ascent would have had to be made up a steep rock face. He decided to keep it in mind as a possible last resort but, meanwhile, to enlarge the circle of his acquaintance. On, up the inlet Mischief went, in search of the perfect glacier; and on we went in her wake. Six miles on from Nigel, the Peel inlet opens into a wide bay, and from this bay there are two arms. One continues northward, and the other turns sharply to the right. This right-hand inlet is known as the Calvo – although who named it so, and why, I know not. Perhaps it has something to do the amount of calving which goes on in here. It was created by a whole family of glaciers – as, indeed, were all complicated valleys with numerous branches – but whereas only the geologist or the glaciologist can see the ancient rivers of ice which carved a place now filled with forests and fields or with a fiord, in this case there is no need to close one’s eyes and imagine. Bring up the Google satellite image of this inlet, if you will, and you will see that it is still chock full of glaciers. Onward, Mollymawk! By now I had developed a passion for these awesome ‘installations’ of Mother Nature. I could hardly wait to lay eyes on the Calvo inlet. Approaching the bay, aforementioned, we noticed a dramatic rockfall from the wall opposite the Calvo estero. Rockfalls are common in this region. The soil covering the steep mountainsides could not even be described as light; it consists of moss sitting atop lichen. Shrubs and trees taking root amongst the moss add to the weight, and so it goes on – until one day the camel’s back breaks. A shower of rain or a crop of berries, perhaps, is the last straw, and the whole lot comes tumbling down. And then, after the rocks have ceased their shrieking and lie still, Nature begins again. Nature… That’s all of us, too. Aren’t we just the same as those plants desperately fighting for the right to light and space, and all the while adding to the burden; all the while adding to the inevitability? Allegories were all around us in this place where Nature moves to dramatically, but the moral of the story…? If there is a moral it escapes me. Rocks, in the entrance to the Calvo inlet, rounded by an ancient glacier. Do they look as if they are about to fall? 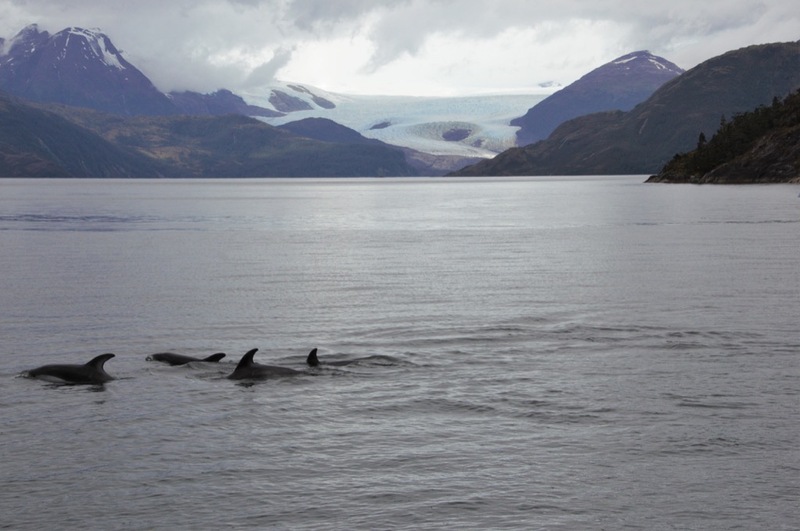 As we came around the corner and came within sight of the first glacier in the Calvo estuary we were once again joined by a group of Peales dolphins. By now the wind had fizzled to almost nothing, and so we drifted lazily and watched their antics. Most of their time seemed to be spent either foraging or socialising. When they moved purposefully to and fro, now and then twisting back in their path, we reckoned they were hunting for fish; but when they chased back and forth energetically and butted one another… well, that could be either a scuffle or a playful cuff – or perhaps those collisions occurred accidentally, in the pursuit of fish? 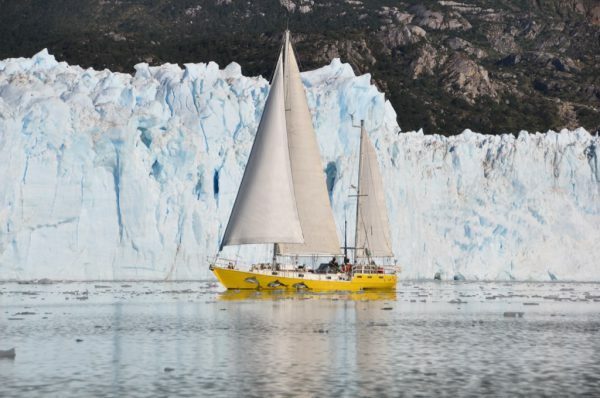 We had hoped to be able to approach close to the glacier which Tilman and his companions eventually climbed, anchoring where Mischief dropped her hook; but by now we had finally arrived amongst the ice. Tilman, of course, had fought his way through it all the while, and by the time he reached the Calvo he was almost inured to the sound of it crashing past the hull. He even spent the night anchored amongst the floes, on the north shore of the inlet. Well, when you think about it, he hadn’t much choice. It was either that or go away empty-handed. 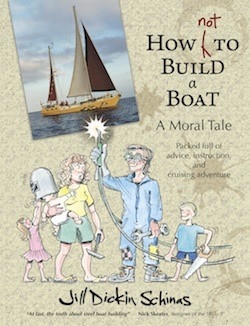 Either bash on – quite literally – and risk all, or else abandon the project; in which case, the purchase of the boat and the travails of an entire year would have been in vain. Hardening our hearts we drove the long-suffering Mischief slowly through a mile of thickly clustering floes … At last this frightening and heart-rending shunting of ice came to an end and by eight o’clock we had Mischief anchored in seven fathoms [12 metres] only fifty yards form the beach. As anchorages go this one was more spectacular than safe. Within a stone’s throw of us was a fantastically furrowed cliff of sapphire blue ice. … Around us lay a slowly circling mass of floes of alarming size, some of them as big as a cottage with the garden thrown in. Tilman had evidently not heard what happens when a glacier calves. 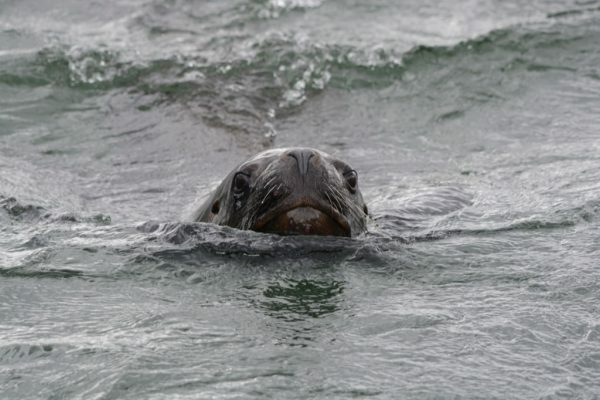 The snout of a tidewater glacier is afloat. The slices of ice forming the front of the snout may seem to be ‘only’ one hundred feet tall when in fact they can be as much as seven times taller, for most of the bulk of this floating glacier lies below the water. When a pinnacle of ice breaks up and the pieces of ice go tumbling into the water below, that’s all very well; the worst that they can do is create a rolling wave proportionate to their size. But when an entire slice detaches from the front of the icy cliff, having fallen down into the water it arises again – and it arises on its side. If the ice crumbles, that’s all very well, but if the glacier drops an entire pinnacle or the front of the wall sheers off – as can happen – then a vessel less closer than seven times the height of the glacier can be endangered. Tilman was almost certainly within the danger zone. If the glacier calved then its offspring, hurtling to the surface, would strike the boat so hard as to split it in two. But, in fact, he probably was aware of this fact. He was, after all, a hero of the Battle of the Somme and a member of the Distinguished Service Order. Deadly peril didn’t disturb him quite as much as it does the rest of us. Tilman was well aware that if more ice drifted in it could trap Mischief or even push her up onto the shore, thereby leaving her crew stranded, yet he pressed ahead with his plans. On the following morning he and his fellow climbers went ashore to reconnoitre. And they eventually made their ascent at the side of this glacier, crossed the ice cap, and descended to Lago Argentina. Access to the Tilman glacier was obstructed by a field of bergy-bits and growlers. Being a lot more timid that Tilman – and having much more to lose, since our boat is our home; and having no real reason to force our way through to the place where Mischief anchored – we retreated to a cove on the opposite side of the Calvo inlet. Here we imagined that we might abide in perfect safety – but we were somewhat mistaken. In mentioning this caleta our favourite cruising guide points out that it would be possible to become trapped in here. If a bergy-bit happened to run aground in the narrow entrance it might block the way for days. This is true – but it didn’t worry us too much, partly because there were very few big bits of ice in the vicinity but also because we were carrying plenty of food. If the ice besieged the entrance we would wait till it melted. What we hadn’t expected was for the entrance to be so shallow that Mollymawk could hardly get within. To be fair, the RCC cruising guide shows only 2.5m in the entrance at low tide; and it was low tide. Mollymawk draws 2.3m, so we should be able to slip through – just. Whenever we are entering a new anchorage we have one person on the bow, looking for rocks, and another whose job it is to watch the echo-sounder, never taking their eyes from the numbers. That second job generally falls to me, and so it was on this occasion. Caesar was on the helm, and as the numbers tumbled down, from 65m to 30 and then, within a boat’s length, to 12, he took the engine out of gear, slowing our approach. From ten metres the depth went down so fast that I could hardly keep pace, but at 0.7m (70cm of water under the keel) they began to climb again. I breathed a sigh of relief as I continued my recitation, and Caesar put the throttle ahead again. Too soon! Down we went again: “One-point-seven. One-point-four. One-point-three. One-point-two. One. Nought-point-nine…” – BANG! BANG! We hit that rock so hard that the boat jolted and lurched and various things fell of various shelves. Our echo-sounder is set to read 0.0 when we are aground, but the keel had evidently not been following precisely the line explored by the magic eye, and the bottom was evidently not perfectly even. Roxanne and Nick went to sound the channel from the dinghy while Caesar and I discussed alternatives. There were not many, unless you included Tilman’s ploy of anchoring amongst the floes. Thus, when the surveyors returned with the news that we might just squeak through now that the tide had risen a few centimetres we resolved to give it another go. In the event the echo-sounder once again fell to 0.9 – but this time the keel followed the same course, dodging that stray rock. And we were in.